About 1,500 live in such major cities as Shanghai, Beijing and Wuhan and in Fujian Province on the mainland. 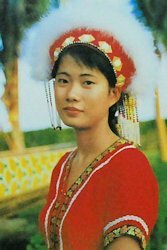 The Gaoshans do not have their own script, and their spoken language belongs to the Indonesian group of the Malay/Polynesian language family. The Gaoshans are mainly farmers growing rice, millet, taro and sweet potatoes. Those who live in mixed communities with Han people on the plains work the land in much the same way as their Han neighbors. For those in the mountains, hunting is more important, while fishing is essential to those living along the coast and on small islands. 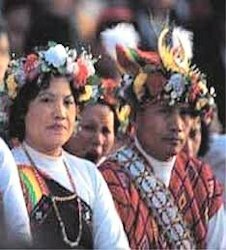 The Gaoshans are monogamous and patriarchal in family system, though the Amei tribe still retains some of the vestiges of the matriarchal practice. Commune heads are elected from among elderly women and families are headed by women, with the eldest daughter inheriting the family property and male children married off into the brides' families. 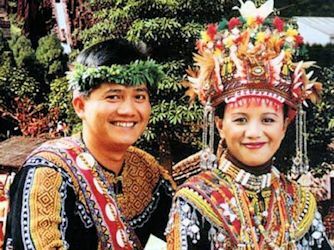 In the Paiwan tribe, either the eldest son or daughter can be heir to the family property. All the Amei young men and some of the Paiwan youths have to live in a communal hall for a certain period of time before they are initiated into manhood at a special ceremony. In A.D. 230, two generals of the Kingdom of Wu led a 10,000-strong army across the Taiwan Straits, and brought back several thousand natives from the island. At that time, the ancestors of the Gaoshans belonged to several primitive, matriarchal tribes. Public affairs were run collectively by all members. Their tools included axes, adzes and rings made of stone and arrowheads and spearheads made of deer antlers. Animal husbandry was still in an embryonic stage.